Holland, Michigan celebrates its Dutch heritage with an annual tulip festival. The city literally has millions of them. In addition to the May festival, the city offers white sandy beaches on Lake Michigan for visitors and residents alike. Recently recognized by U.S. News and World Report for excellent care in hip replacement, Holland Hospital provides those in the greater Holland area with a full range of health care services. The hospital also serves those in Ottawa and Allegan counties. Kevin Heck, BMET I, works for Aramark Healthcare Technologies in the healthcare technologies department at Holland Hospital. Heck first learned about an available biomed job at the hospital through his wife. “I always enjoyed repairing equipment and working with people. I have an associate’s degree in industrial maintenance. I wasn’t able to use my degree in my previous position and I was looking for a change,” he says. “My wife, Kara Heck, who at that time was a nurse educator at the hospital, told me about a position open in biomedical engineering,” Heck says. Entering biomed meant some additional training at the time. “Yes, I had to go back to school for my biomedical engineering degree. I did this at Muskegon Community College; however several of my classes from my earlier degree did transfer over,” he says. “I started at the entry level; equipment distribution. I was working 30-hours a week and going to school. That was a very valuable time for me in mastering my client relationships, and communication skills. I have been promoted to BMET I now,” Heck says. While not considering himself a specialist in any one area, Heck says that he gets good cross-training on the job. “We try to cross train everyone with everything at our department. With that said, I am now starting to take over and be the main technician for all of surgery. This includes the anesthesia machines and sterilizers. I also assist in radiology,” he says. Heck has been involved in some special projects. His resourcefulness has helped make things work and also makes distinguishing networks easier for his colleagues. “I was involved in bringing in Smith medical epidural and PCA pumps. I noted the power plug could not be attached and would keep falling on the ground. I contacted a local machine shop and had a custom bracket made to hold the power cord on it to prevent damage,” he says. He was also on a team to deploy a Massimo Root vital sign machine and a Rad 5 pulse-ox to every hospital room. 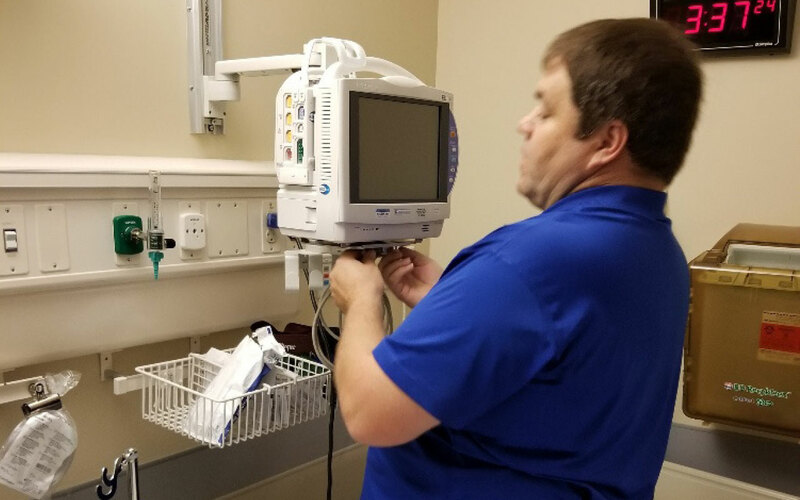 “I coordinated all testing to verify alarms traveling to our Vocera device, which is a communication device that our clinical staff wear – it allows for alarms to be sent from our devices to the end user,” Heck explains. “At the same time that we were testing, I was also implementing the mounting arms from GCX into each room of the hospital. I made the network cables to connect into the network and I shortened the power plugs so all the cable management would be set right and we get no calls for loss of connection or no power,” he adds. Another recent project he was a part of was deploying Nihon Kohden to ED, ICU, ATU, Stroke, TU, and Cath Lab departments. “During this deployment, I have started a hospital color coding system for all the separate networks within the hospital. Example; all Massimo network cables are blue, Nihon Kohden is yellow, each network has its own color and we are starting to color the wall ports to prevent the wrong device plugging into the wrong network port,” Heck says. “I also had to purchase different mounting arms from GCX to mount the new devices, and make the network cables and order 90-degree power plugs for the monitors,” he adds. Heck says that whenever there is an update to the EMR, he verifies in their test domain that the communication with the devices is intact. “We are the only hospital that is fully integrated with our Baxter IV pumps. I helped to set barcodes for scanning and association of these pumps to our EMR,” Heck says. When not maintaining medical equipment, Heck enjoys working with a different set of tools as well as spending time outdoors. On the family front, Heck has been married to his wife, Kara, for 15 years. They have three kids; Kaitlynn, 13 and a set of twins; Jenna and Justin who are 12 years old. “All three kids are in sports, so we get to go to support them at soccer, volleyball and basketball games as well as dance competitions,” Heck says. What would Heck want readers to know about him? “I thoroughly enjoy this field of biomedical engineering. It allows me to be a part of the health care system that I find highly rewarding,” he says. 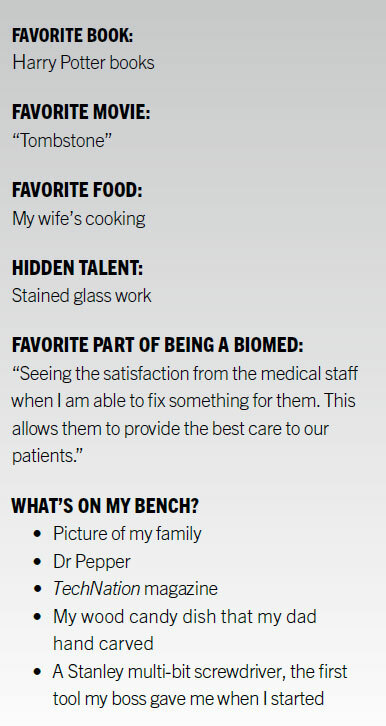 “I am able to help our patients and our staff in order to have the best outcomes possible. When our twins were born, our daughter had to spend some time in an incubator. When she was able to come out, we were, of course, overjoyed that she was OK. Now that I work in the hospital, I look at every piece of equipment that I fix as if it has a potential that one of my family members were going to need to use it,” Heck adds. He also enjoys creating and bringing new ideas to the table. “I like to think outside of the box on how we can efficiently and effectively tackle new problems,” he says. As a resourceful HTM pro, who comes up with some creative install solutions, he is a great resource to the Holland, Michigan community.